Explore the eTRIKS Harmonisation Service! We would be happy to hear from your experience and for feedback, any issues/ suggestions on this, please contact us by email to Ibrahim Emam at i.emam@imperial.ac.uk. 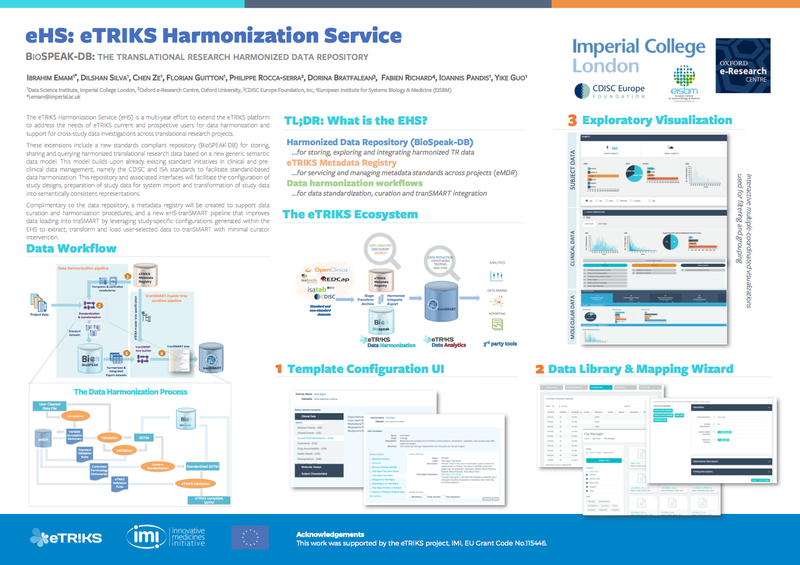 The authors would like to acknowledge the following contributors to the eTRIKS Harmonisation Services: Yi-Ke Guo, Ibrahim Emam, Dilshan Silva, Chen Ze, Florian Guitton and Ioannis Pandis of Imperial College London; Philippe Rocca-Serra of Oxfrod e-Research Centre, Oxford university; Dorina Bratfalean of CDISC; Fabien Richard of the European Institute for Systems Biology. In addition, the authors acknowledge the contributions of the IMI and EFPIA.